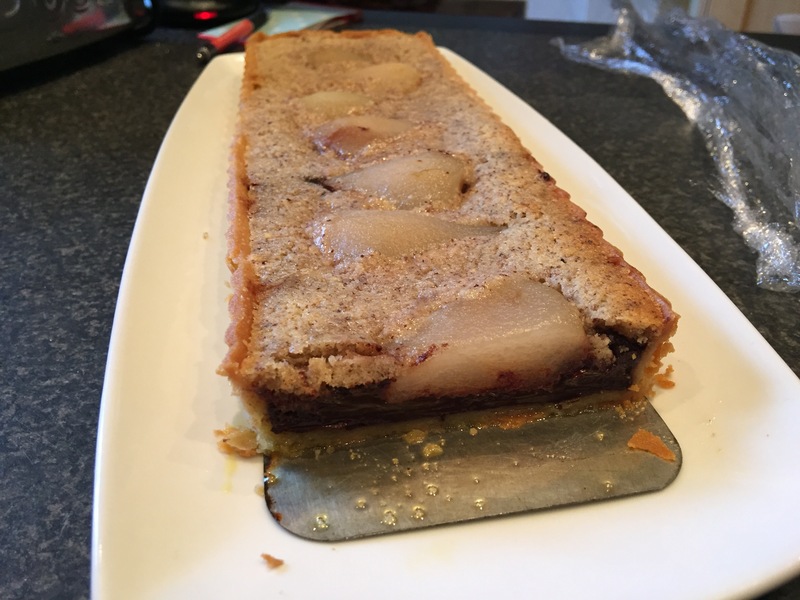 Chocolate pear and hazelnut frangipani tart. What to do with the defrosted lump of sweet shortcrust pastry, leftover chocolate ganache, excess hazelnut frangipani and those pears in the fruit bowl which have refused to ripen !! Make a tart! Moral of this blog ? Never throw out that piece of leftover pastry and your sure to get a use out of it . Love is in the air… Well it should be after you’ve went to all the bother ( can you tell I’ve been married 20 yrs !) 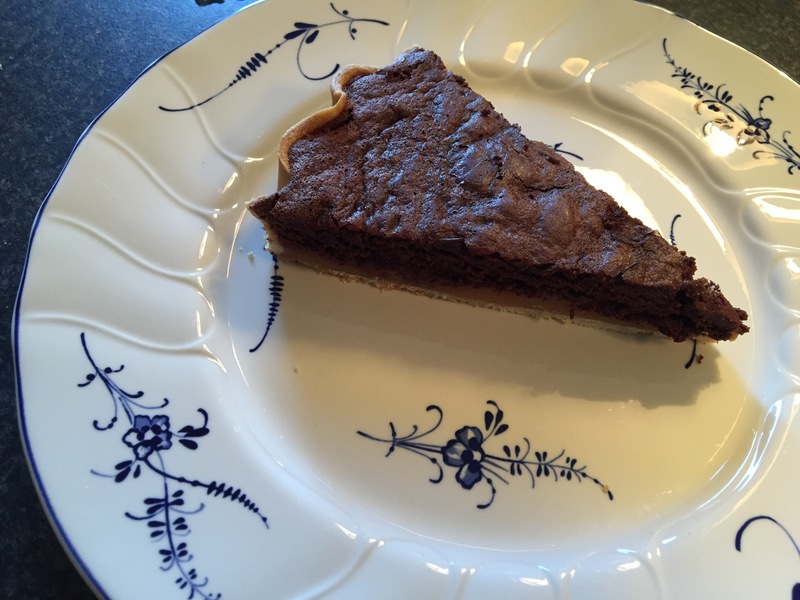 of making this decadent tart for your one true love. Wrap and chill pastry in the fridge for 1/2 hr. Then line a 9″ loose bottomed tart case with pastry and blind bake for 15 min at 180 degrees then take baking beans out and bake for a further 5-8 min till pale gold colour. Set aside to cool. For your salted caramel filling, again take the easy route ! ( clearly my mantra these days ) and microwave ( 900 microwave) all ingredients barr the salt for 1 min intervals with a quick whisk each time X 10 to get a golden caramel, now add salt to required saltiness ( everyone is different- I like lots ) but once caramel is cool and you pour it over base of tart, taste it and if not salty enough , sprinkle over dome salt flakes. Cool. In a medium bowl place 100g dark chocolate and 75g butter, melt in the microwave, set aside to cool . In another bowl, whisk 2 lg eggs, 1 egg yolk and 50g caster sugar, whisk till pale and thick ( about 6 min ). Add 50g Cocoa to the chocolate mix and combine with egg mix. Folding it in evenly. Pour over cooled caramel and bake for 20-25 min till just wobbly in the middle. Remove from oven and cool a bit before serving or indeed, chill it and serve next day … Preferably with poring cream. 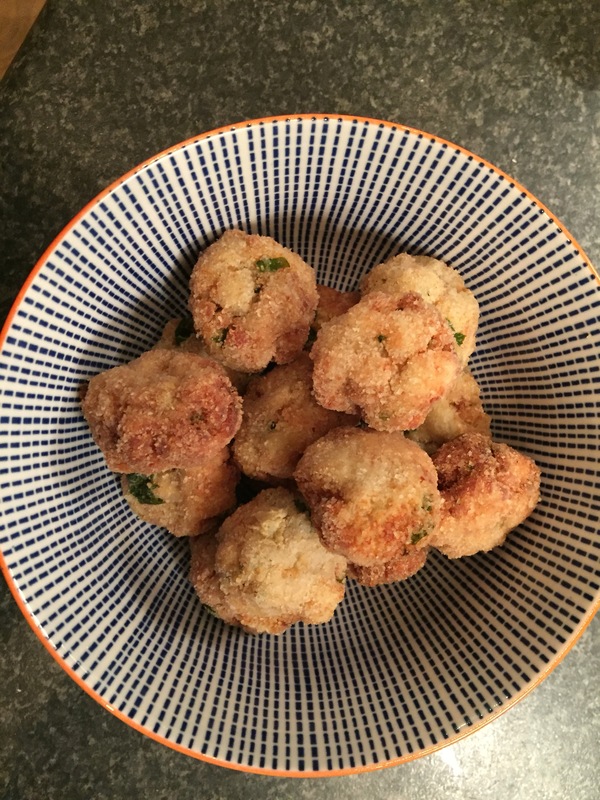 These delicious, spicy, Indian inspired fish balls are the result of marrying two recipes from different cookbooks. In a food processor, whiz the onion, egg, salt and sugar. Measure the matzo meal into a bowl together with the chilli and spice and add the onion mix. Combine. Put the fish fillets into the processor and pulse ( you don’t want a purée just an amalgamation) then add this to the onion mix, combine then refrigerate for 1/2 hr . To make the fish balls, heat the oil in a large pan . Meanwhile take a walnut sized piece of fish mixture and with wet hands, roll into a ball. 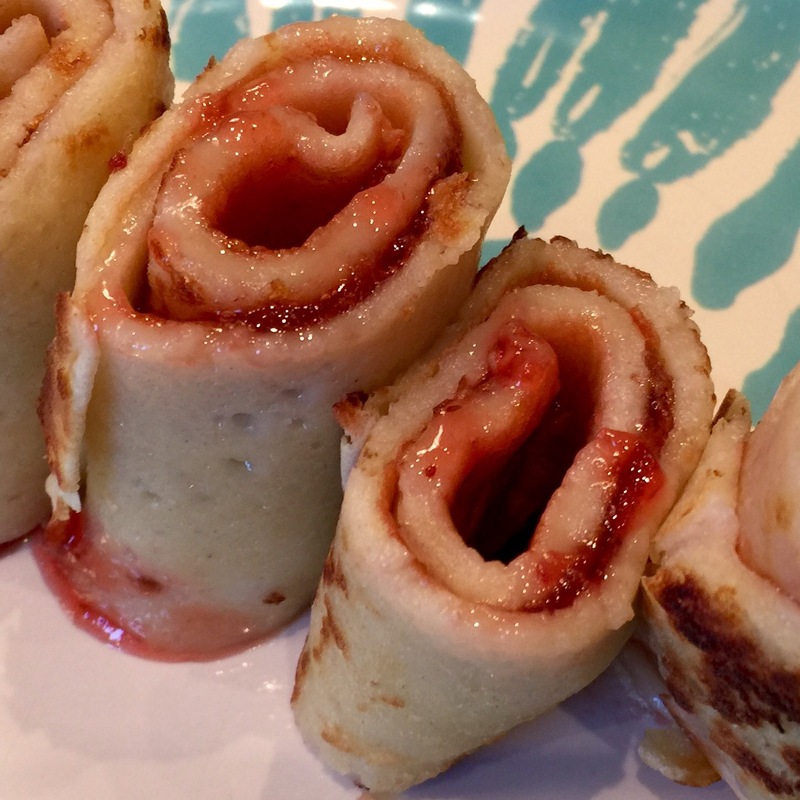 You can roll it in a little matzo meal to stop it sticking to the plate and each other ! Continue till mix is used up . Fry in batches, mindful of not overloading the pan and lowering the heat. Turn to evenly cook and remove when golden all over. Test one for cookedness ( chefs treat !) . These are great straight from the pan, but unfortunately your not so hot ! Neither is the kitchen, as everything smells of fried fish !! So I would do these the day before you need them. Air your house ( and wash your hair ! ) and your set to go . They don’t need a dip, but if you feel you want one ( let’s face it fried fish and tartare sauce is a match made in heaven) try this coriander chutney with them. It has the right flavour match to the Indian spices. Place all the ingredients in a mini processor and blitz till smooth. Add a little Greek yoghurt if you like, to make it more dip like. But I like that verdant green of the naked sauce. I’m sure there will be a glut of pancakes being posted today and as I recon you can never have too many ! Here’s mine too… Eaten so fast I was half convinced I’d not made any ( but for the mess ! Jam/ Nutella etc everywhere). 30g butter, melted and put aside to cool. Plus a little more for frying. Whiz the flour, milk and egg, then add the melted cooled butter, stir to combine. Heat your frying pan ( a shallow one about 8″ diameter) , melt some butter in it then wipe it out. Add a couple of tbls of batter to the pan and tilt to spread it evenly. In a minute, it’s ready to flip ( if your feeling frisky ! Unlike me who wimps out every time and uses a spatula, much to my kids disgruntlement), a matter of 1/2 a minute and it’s ready. In truth, I’ve always doubled this amount as they keep well in the fridge ( not that this unlikely of events has ever happened in my house). The above quantities will give you about 6 large crepes. This delicious warm salad is great all year round. It’s both filling and packed full of gorgeous South American flavours. In a large, deep frying pan ( with a lid ) dry toast the quinoa over a medium heat for 3 minutes. Add the stock, bring to the boil and pop the lid on, reduce heat and simmer for 12-15 minutes. The stock should have been absorbed and the grains are tender. Empty onto serving plate and put aside. Rub the ground cumin into the steaks and season. Heat 1 tbls oil in a large frying pan/ griddle, cook as you like (personally I like steak medium). Set aside to rest. In a processor, whiz the oil, herbs,chilli, garlic,lemon juice, honey and 2 tbls of water, till smooth. Reserve 4 tbls of dressing and stir remaining through the quinoa. Add quartered tomatoes. 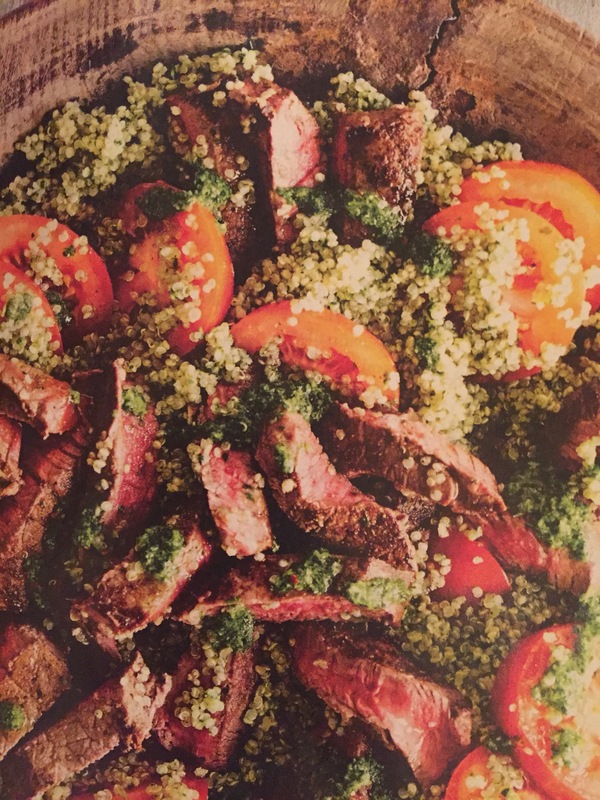 Slice steaks and arrange over salad then drizzle with the remaining dressing. You could serve it with a green salad and tortillas to scoop it up ! These little Thai inspired patties are bursting with flavour, every time I make them, they disappear in seconds. Easy and quick to make. They are low fat too – boon ! 2 thick slices of stale ( day old ) bread (100g) crusts removed. Place them in a bowl and cover with cold water . Remove and squeeze liquid out after 10 seconds. Place all ingredients into a food processor and pulse till combined but not a purée ! Using lightly flowered hands divide into 12 and either – fry in a hot frying pan with olive oil ( couple of minutes on each side) or for a healthier option place on an oven tray and bake for 15-20 minutes at 180 degrees, till golden and puffed. 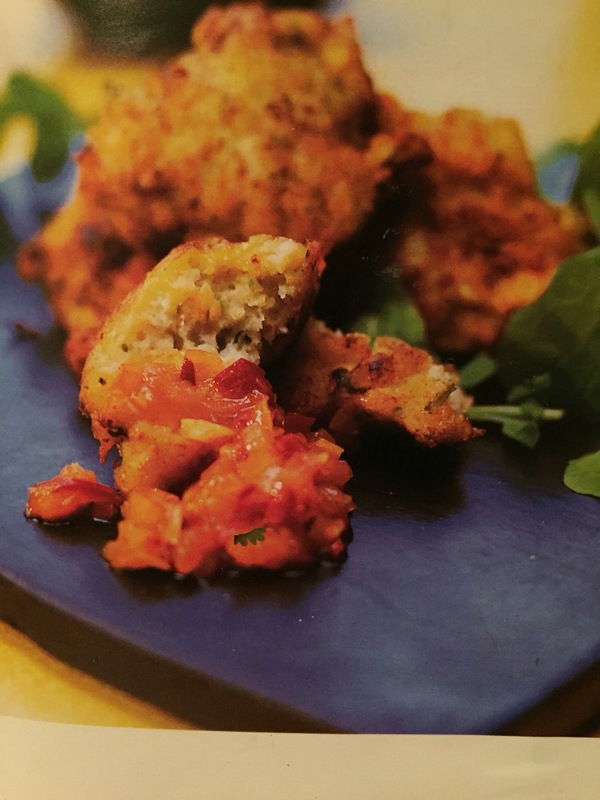 Serves 4 as an appetiser or you could make smaller ones and serve with drinks before dinner . Make this when that grey lid is on- in Glasgow, Scotland terms, that could be most days !! and it will cheer you up. I would melt 500g milk chocolate ( in the microwave for speed ),and in another bowl mix the chosen fillings, breaking up the biscuits and clipping the marshmallows ( if big ones ) into smaller pieces using scissors. Mix the melted chocolate and dry ingredients together then pour into tin, spread it out and pop into the fridge to set. At this point ill often melt a couple cubes each of white and dark chocolate then, Jackson Pollok style, randomly drizzle each over the slab of deliciousness. When you want to portion it, take tray out of fridge and leave for about 1/2 an hour, this ensures it will cut cleanly rather than splintering!, though even that wouldnt be a train smash as it will be devoured tout suite! using a hot knife also helps, just keep a jug of hot water to hand to dip the knife after each cut. Other combinations/ random ingredients ive used are :- dried cranberris or indeed and dried fruits- mango, banana, blueberry, apricots, you get the picture… nuts of any description, use any bits and bobs, chuck it in and it’ll be tranformed into something better, guaranteed!. Smarties, popping candy or jelly babies add colour and fudge or chopped up snickers bars or whole malteesers are great. See, i told you the list of possibilities were endless.